Matthew 16: 1-4 "The Pharisees and the Sadducees came to Jesus and asked Him to show them a sign from heaven." He replied, "In the evening, you say it will be good weather because heaven it is reddish, and in the morning, there will be a storm because the sky is cloudy and threatening … You know how to discern the aspect of the sky, but not the signs of the times This evil and adulterous generation looks for a miraculous sign, but it will not be given more sign than that of Jonah. "Then Jesus left them and left." There were two groups of people who followed Jesus, the Pharisees and the seducers, and they followed him to create problems for him, to let him know what they knew and to examine if Jesus was the Messiah. These ones, demanded a signal from heaven. He explained that people observing the sky and detecting if there were black clouds, knew that the sky was threatening with rain and that was the practice to predict the weather of that day or in what season they were. Matthew 12: 40-41 "For as Jonah was in the belly of the great fish three days and three nights, so shall the Son of Man be three days and three nights in the heart of the earth." 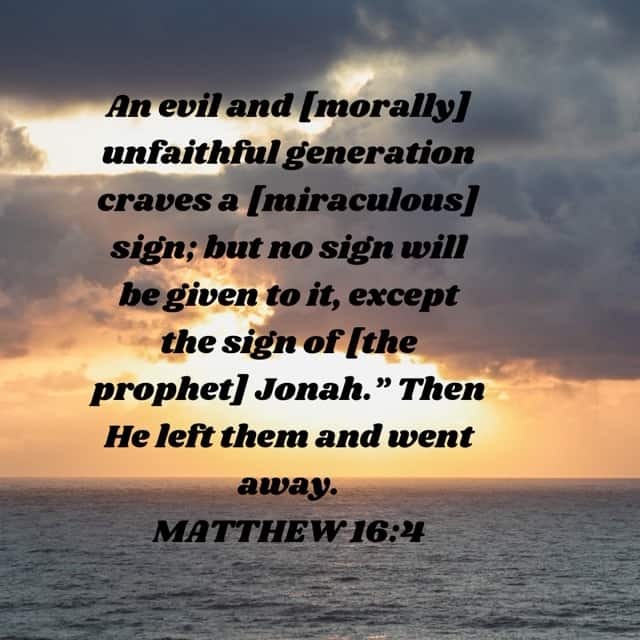 The men of Nineveh will rise in judgment with this generation, and they will condemn it, because they repented at the preaching of Jonah. " They did not even understand that Jesus after death would be resurrected on the third day. In other words, they did not know him. But you who know Jesus, do not let go. Matthew 24: 37-40 "But as in the days of Noah, so shall the coming of the Son of Man be, for as in the days before the flood they were eating and drinking, marrying and giving in marriage, until the day that Noah entered in the ark, and did not understand until the flood came and took them all, so will the coming of the Son of Man be. "Then two will be in the field, one will be taken, and the other will be left. Grinding in a mill, the one shall be taken, and the other shall be left: Watch therefore, for you do not know what time your Lord is coming, but know this, that if the householder knew at what time the thief come, watch, and not let your house be undermined, therefore, you also be ready, for the Son of Man will come at the time you do not think. " 1. REAGRUPAMIENTO OF THE NATION OF ISRAEL. "The Declaration of Independence of Israel, took place on May 14, 1948 at the Museum of Art in Tel Aviv, at number 16 of Boulevard Rotchschild, coinciding with the legal end of the British Mandate of Palestine, the longed for" Land of Israel " »(Eretz Israel) of the Jews. Another historical fact is the transfer of the United States Embassy from Tel Aviv to Jerusalem, taking place on May 14, 2018. This implies that his presence in that city is a sign of protection and defense of the people of Israel. . The reconstruction of the Temple is almost a fact, it has been reported informally that the structure is already in place, and could be reconstructed in terms of weeks. Date is still unknown, but could occur at any time. Also, some already say that they are breeding goats, which were believed extinct, for sacrifice in the temple. Right now, the land of Israel is fruitful, to the point that many products that are produced in the country, are being exported to many countries of the earth. This earth is blooming. Isaiah 27: 6 "Days will come when Jacob will take root, Israel will blossom and sprout, and the face of the world will be full of fruit." We are living in the last times, before the coming of the Lord. 1 Thessalonians 4:16 "For the Lord Himself will descend from heaven with the voice of an archangel and with the trumpet of God, and the dead in Christ will rise first, then we who live, who remain, will be snatched together with them in the clouds to receive the Lord in the air, and so we will always be with the Lord, so encourage one another with these words. " 2. THE CREATION OF MILITIAS AROUND THE WORLD AND THE PERSECUTION OF CHRISTIANS. Likewise, the enemies of Israel are expanding and the persecution of Christians has increased: North Korea, Somalia, Sudan, Syria, Iran, Libya, etc. And at any moment they can come and try to destroy Israel. But Israel, has the best satellites in the world, as well as one of the best armies. Because many problems in the world have been spreading and seem to be out of control, the United Nations is already talking about a Global Government and putting a 666 mark. In fact some countries have already implanted micro chips to people. And it is estimated that between 10 to 15 years will be posted bar codes on the arms or fronts of citizens in many countries. Matthew 24:14 "And this gospel of the kingdom shall be preached in all the world for a testimony to all the nations: and then shall the end come. Jesus said that all these things would happen. The gospel is already being preached across the world, it is true, it has not yet reached every corner, but with the internet, social networks, satellite television, satellite radio, preaching at all levels, we are reaching Unimaginable places. 1. Live a life of holiness. Because God will come as a thief in the night. Everything will be loose. Nothing we have: riches, ways of life, nothing will be worth when we find ourselves before God. We must live a holy life, that pleases God, expectant that the Second Coming of Jesus is ready. Separated from the darkness. 2 Peter 3: 10-11 "But the day of the Lord will come like a thief in the night, in which the heavens will pass away with a great noise, and the elements will be burned with fire, and the earth and the works that are in it will be burned up. Since all these things have to be undone, how can you not walk in holy and pious way of living, waiting and hurrying for the coming of God's day, in which the heavens, lighting, will be undone, and the elements, being burned, they will melt! But we expect, according to their promises, new heavens and new earth, in which justice dwells. Jesus said: you are the light and the salt of the earth. He has to find us with clean clothes. 2. Work for the Lord. When the Lord comes, nothing will count, nor your money in the bank, nor what you have reached. He will ask you: what did you do for me ?. Tell the sinner that he is going to die, because if we do not tell him about Jesus, then his blood will fall on us. We have to do the work of Jesus while we await his coming. John 9: 4 "It is necessary for me to do the works of him who sent me, while the day lasts, the night comes, when no one can work. Source: Thank you Dr. Sundar Sangmal for your teachings.